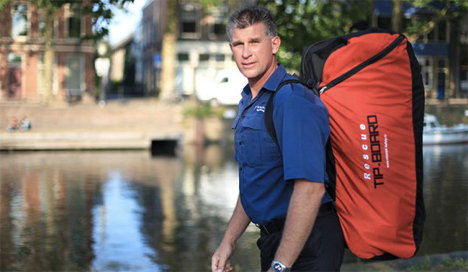 The typical human doesn’t have to think of the best way to rescue other humans from drowning on any given day, but the Dutch fire service has to consider it quite often. The team at Spark Design & Innovation came up with a new device that could make water rescues far easier, and the design is pretty ingenious. 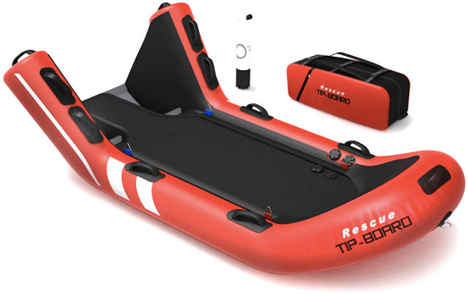 The Rescue Tip-Board is an inflatable raft that could seriously revolutionize water rescues. Typically, pulling someone from a body of water involves either throwing a line to them from the shore (which doesn’t work when they aren’t responsive) or paddling out to them in a raft or boat that just might capsize when you try to haul an entire person onto it. Not to mention the sheer strength it takes to pull someone onto a life raft from that very precarious angle. This is what the Rescue Tip-Board solves. It’s not a typical inflatable raft; it’s actually designed to let the operator stand up on one end, tipping the raft forward. From this angle the rescuer can reach down, grab the victim in the water, and simply shift their body weight backward to create a lever effect that pulls the victim up and onto the raft. The idea is that the rescuer and the raft will be towed out to the victim behind a small watercraft, then towed back to the shore so the rescuer can stay with the victim and perform life-saving tactics if necessary. When the inflatable fabric raft is deflated, it is small and lightweight enough to be worn as a backpack. A small can of compressed air inflates it in seconds and it can be in the water in almost no time.